This proposal will improve the BitShares infrastructure and performance for all users. If you have an account for BitShares, then you can follow the steps below to vote for the infrastructure improvements. It costs just a fraction of BTS (0.017). Just go to your account and select 'ACCOUNT' tab at the top. From there, access the Voting section. 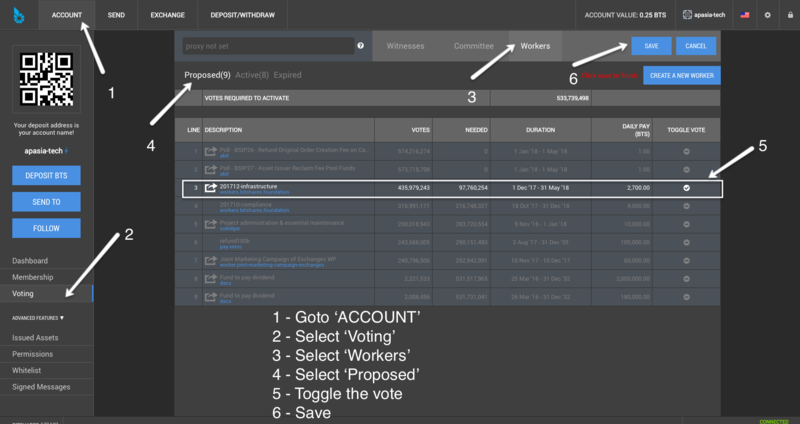 Select 'Workers' tab and 'Proposed' to view the not yet voted into action proposals. Toggle your vote for the proposal, then SAVE. Your vote counts towards the decisions BitShares makes as a business. If you aren't familiar with voting for BitShares worker proposals, detailed coverage of this along with witnesses and committee members coming in our next post! Voted, thanks for the informative post. Congratulations @apasia.tech, this post is the third most rewarded post (based on pending payouts) in the last 12 hours written by a User account holder (accounts that hold between 0.1 and 1.0 Mega Vests). The total number of posts by User account holders during this period was 3178 and the total pending payments to posts in this category was $2153.84. To see the full list of highest paid posts across all accounts categories, click here. This post has received gratitude of 2.30 % from @appreciator thanks to: @apasia.tech.